This is the time of year when I turn my attention to my kitchen garden, namely, growing sprouts. Which brings me to a paleo diet question. From what I understand, legumes are not allowed in the paleo diet, however during sprouting the legume seeds germinate and become living plants which are now vegetables (think mung beans sprouts in the produce section of the food market), so are sprouts allowed? If yes, do the recipes below meet the paleo diet guidelines? I hope readers who are following the paleo diet will weigh in and start a discussion. This past week I was growing chickpeas (garbanzo beans) sprouts, experimenting and trying to find new ways to enjoy these delicious and good for you sprouts that are also pesticide free. In order to have sufficient sprouts to play with, I started out with 3 cups about 1½ pounds (that’s the max my colander can accommodate) of dried chickpeas (I buy my chickpeas from the health food store). 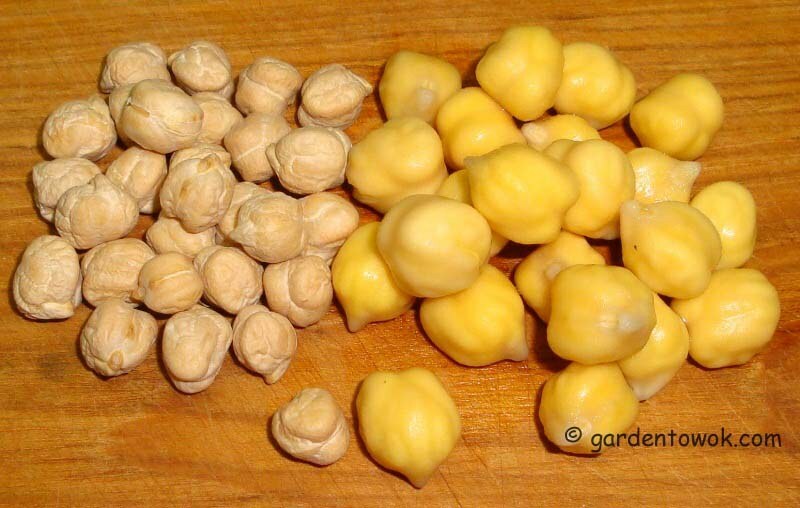 Click here to learn about Growing Chickpeas Sprouts. 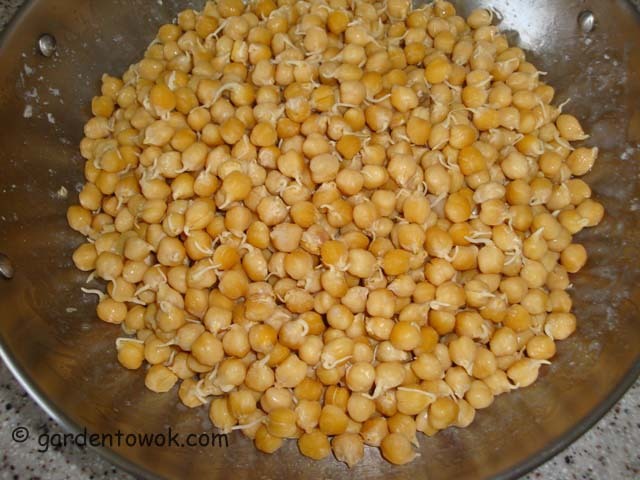 • 1 cup of chickpeas sprouts with 2 tablespoons of tamari and 2 teaspoons of maple syrup. • Let stand 30 minutes. • Drained and spread single layer on a parchment lined sheet pan. • Baked at 325°F for 25 minutes. The chickpeas sprouts at this point had a nice moist chewy texture which I liked very much, however because they were not very dry, I worry they will not keep well at room temperature for any length of time and decided to bake another 10 minutes. Mistake. They became quite hard. Not wanting to crack or worst yet break a tooth, decided to toss them out. Just as I was about to toss out the above, my inquiring mind wanted to know: what if I rehydrate them? Having nothing to lose but certainly something to gain decided to place the dried sprouts in a pot, covered with water, brought to a boil and simmered for about 5 minutes. This softened the sprouts. They were delicious and made a tasty snack. Thinking: Why not make a meal with them? Had some broccoli florets in the fridge and a leek in storage in the garage (see NOTE). Combined and made a Chickpeas Sprouts, Leek and Broccoli stir-fry. This was a very satisfying vegetarian meal. • 1½ – 2 teaspoons arrowroot starch, tapioca starch or corn starch combined with 1 tablespoons water or broth. Stir well before adding to wok/frying pan. 1. Heat oil in a wok or frying pan, add leeks and garlic, stir-fry 1 minute. 2. Add salt and broccoli stir-fry until broccoli turn bright green, about 2 minutes. 3. Add chick peas sprouts and broth. Bring to a boil. Cover and cook until broccoli reaches desired doneness, about 3 minutes. 4. Thicken with tapioca/cornstarch mixture. Adjust taste and serve. P.S. Had some fresh mushrooms in the fridge and tossed them in as well. Sorry no photo, messed up. NOTE: To overwinter the leeks, I stood the harvested leeks, unwashed, in a bucket, surrounded with pro-mix (sand will work also) part way up the green part. Store in the unheated garage. The exposed green tops wilted but the white parts and buried green pasts were in perfect condition (sorry, forgot to take a photo and this was the last leek), another successful experiment. Will repeat this storage system again this fall. Starting to make too many silly mistakes. Learning from my recent published date error and deleted photos incident, decided to stop and turn off the computer while I am still ahead. Please visit tomorrow for the rest of the story post. 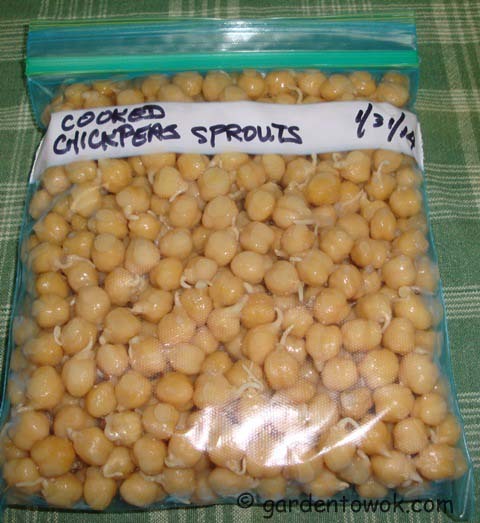 This entry was posted in Growing sprouts, Harvest Monday, Recipes, Sprouts and tagged broccoli, chickpeas sprouts, dairy free, garbanzo beans sprouts, gluten free, leeks, meatless, paleo diet, vegan, vegetarian. Bookmark the permalink. One of these days I will really, really become more tech savvy. You and me both…you have no idea how bad I am with techie things. Instructions on how to fix anything might as well be written in another language as far as I am concerned. You are way better than I. Waiting for my kids to explain to me how you do your photo collages with the titles. I love hearing about your near misses and how you turned disaster into delicious, Norma. I know nothing about paleo. I never get caught up in diets. I eat what I want and assume I’ll be okay. Thanks, my philosophy is: go for it if there is something to gain and nothing more to lose. I am not on any diets but kept reading about paleo so am curious. Don’t know the first thing about the paleo diet, I have never been one for diets, I rather enjoy a healthy lifestyle of enjoying what I like in moderation. 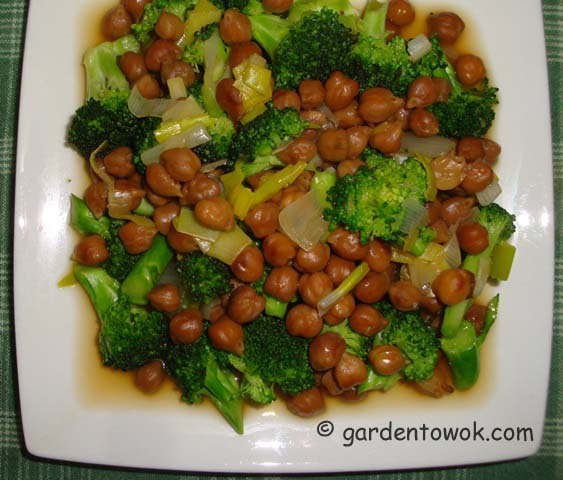 I should eat more chic peas – your stir fry looks great! Have a happy week ahead Norma. I too know nothing about paleo diet that’s why I am hoping readers who are familiar with it will shed some light. I too prefer to eat what I like but in moderation. A happy week to you as well. Hi Norma …. I am not an expert and don’t follow anything like the Paleo diet myself, but I gather that uncooked legumes contain phyto-chemicals that inhibit the absorption of many nutrients. These are destroyed during cooking but, since paleo is essentially a raw diet, legumes are thus off the menu. I am not sure, but I think that once sprouted this is not a concern… or at least less of one. I too do not follow any diet, maybe I should as I would love to shed a few pounds. Am hoping readers who know about the paleo diet would comment so I could learn about it. You are like me Norma, I can’t stand throwing away food. The chick pea dish looks delicious and what a win making it from something that was destined for the compost bin. I have dried chick peas from my health food store on hand, I think I’ll give a go at sprouting them! I Already have a couple of beet tops growing leaves and about 8 green onions getting a second chance! So cool to have something from nothing. And it’s lovely to see growth in the middle of winter buried under even more snow! Thanks for the inspiration! You must have a microclimate in your backyard to have beets and green onions growing this time of year. Sure glad my brain became active before the chickpeas sprouts went into the garbage. The dish was delicious, you may want to add some hot spice to kick it up a notch. Not in my back yard Norma, it’s still under a pile of snow. I’m growing them in a saucer from discarded tops! I’ll send you a photo; my green onions are doing great too and I think my celery experiment will sprout too! That’s so cool and exciting, isn’t it? Snowing since this morning, not sure when it will stop. It sure it. You are my inspiration Norma! Thank you. Thanks, I was pretty pleased with me for the idea. Yes, there is a delightful nutty flavor. We love chickpeas! I need to try the sprouted one…the stir-fry looks very tasty! Was thinking, bet you would work this sprout into one of your delicious breads. I don’t follow Paleo but it might also be because of the lectins in beans. Long soaking times and cooking help reduce the level of lectins as does sprouting. I would think doing both would work even better. I keep thinking of trying this with my beans in general. I don’t follow the paleo diet either but I am eager to learn more about it. I am currently sprouting black eye peas will write about it if I like the results. I love the way your mind works, Norma! 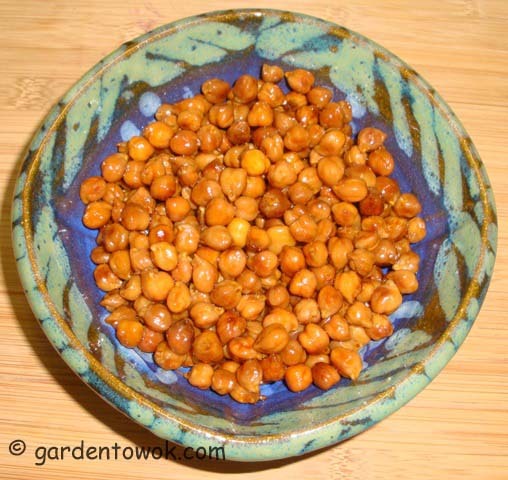 And actually, this post got me excited to try sprouting some chickpeas and using them. I have a bag, about 2 or 3 cups worth, of dried chickpeas from the health food store that have been sitting around waiting to be used for some time now. I’d love to try this stir fry and can’t wait to see your chickpea sprout and kale soup post! Thanks, the way my mind works also gets me into trouble. Hope you will give sprouting chickpeas a try and write about your experience. 🙂 I will definitely write about it when I try sprouting. Those chickpeas are calling to me. Norma, I’m always amazed at what a resourceful cook you are. I probably would have tossed the overcooked beans but you managed to make something delicous with them. Good job! Thanks, nothing to lose but something to gain so figure I will go for it and see what happens. You are welcome. When you do find time from your busy schedule to venture into sprouting chickpeas hope you will write about your experience. I always thought that yellow chickpeas do not sprout. 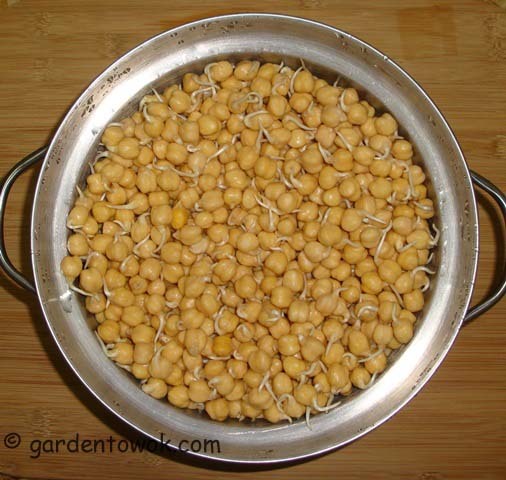 In Indian cooking, we use brown or green chickpeas (available at Indian grocery stores) for sprouting. Mung beans are the best for sprouting. Did not know there are brown and green chickpeas. Must look for them. Where is the Indian grocery store that you shop? From what I read sprouts are healthier than the dried beans, higher nutrients and easier to digest. You are very welcome. Go online and see if you can find more complete info. That’s a great looking dish!! I love to hear about your experiments, both the good and the bad so keep it up, it helps us all to learn from our own (and in this case others) mistakes!! Great post! Thanks. I enjoy experimenting even when it fails as I learn a great deal from my failures. I love to read about your experiments! Both salad and chickpea snack look delicious. Thanks for the info about Paleo diet. Is there a reason why grains are no-no? Does that mean they will not eat green beans, green peas or pea pods? By now I think I’ve cooked to almost any dietary fad there is – atkins, raw, vegan, paleo, southbeach and what not… I’ve found out that in most cases people just can’t stick to these diets for long and feel very frustrated when they quit, which is a shame. Thanks for the information, this seems like a very restricted diet and from what I read an expensive diet to maintain. I am with you: “eat everything sensibly” and I may also add be more active. I don’t know much about paleo either, since I don’t follow it, but am interested in the some of the comments already posted here on it. 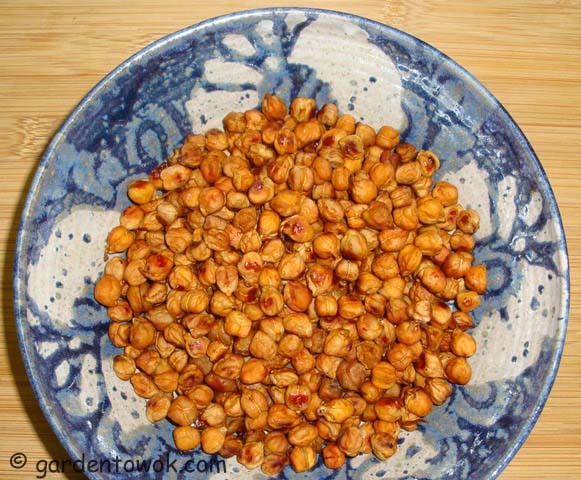 I love chickpeas and have them regularly since they’re a great source of protein for me. And I loved your experiment of re-hydrating. Really good to know!! Isn’t the blogging community wonderful! I am learning so much from the blogs I follow, yours included. I understand sprouts are actually more nutritious than the beans itself, I should pose this question on my next sprout post so we can all learn together. Sometimes my brain comes up with cool ideas. A good week to you too. I am glad too. Sometimes my brain does work. You made a great meal out of a nearly tossed dish and it it looks fantastic! Thanks, marinating the chickpeas sprouts made it very tasty. No I am not trying the Paleo diet, just curious about the concept. Not following any diet, I believe in eating what I like but in moderation. We have been eating mostly Paleo for about a year and it was fun to read so many misconceptions and inaccuracies about the “diet” in the comments. I see why so many people (including myself prior to eating this way) think it’s crazy. Paleo is not a diet but more of a lifestyle that focuses on real food and traditional foods. Refined carbohydrates and most conventional grains and beans aren’t eaten much because of lectins, phytates and digestion. With that being said, there are many Paleo-eaters (there is not a one-size fits all) who occasionally eat these foods and the preferred way to eat them is sprouted and/or soaked for optimal digestion. Thanks for weighing in. So it is just “Paleo” and not “Paleo diet”, am I correct? Sprouts are OK but not the beans, yes? Hi there Norma – my family and I have been following Paleo guidelines for about six months, and I just wanted to add to Everyday Maven’s comment. Paleo probably seems really restrictive if you focus on everything you can’t have, but even on the strictest Paleo regime what you are left with on the menu is a lot of healthy whole foods that you can be really creative with. Some people take Paleo as a template rather than hard and fast rules and in this context sprouted legumes are definitely worth trying out. Some people will be fine with it, others not so much. Personally, I also thought Paleo sounded kind of crazy but for me it was mainly a reaction to giving up things I thought I couldn’t love without. Once I dropped them, I wondered what I had been so freaked out about! Thanks for weighing in on the Paleo lifestyle. Your comment makes a lot of sense and gives me a better understanding.